Here’s a quick and easy recipe just in time for all those summer picnics. 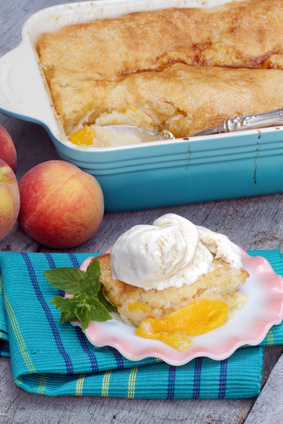 Replace the peaches with any fresh summer fruit or in a pinch use canned fruit and skip the first step of cooking fruit with water and sugar. Put the butter in a 8×8 inch baking dish and place in oven to melt. Mix remaining 1 cup sugar, flour, and milk slowly to prevent clumping. Pour mixture over melted butter. Do not stir. Spoon fruit on top, gently pouring in syrup. Sprinkle top with ground cinnamon, if using. Batter will rise to top during baking. Bake for 30 to 45 minutes or until golden and bubbly. Spoon on to plates and top with whipped cream or ice cream.